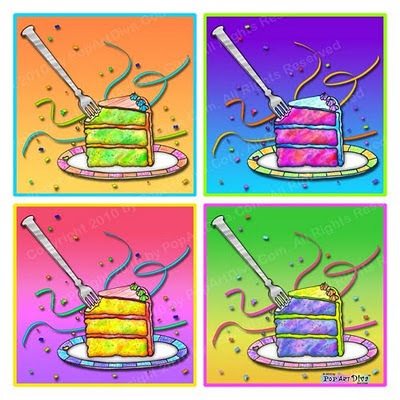 My latest Pop Art - CAKES! Low Fat, no sugar - just sweet. I've been wanting to start a series of pop art food for ages. I did my first one around my birthday in January - Pop Art Cupcakes, then last month I did a pop art of Popsicles and Pop Art Ice Cream Cones because I was posting ice cream martini recipes on The Martini Diva. It got me started! Yesterday I did this fun Pop Art of a slice of cake with a fork stuck in it and a bite already gone. I added some fun confetti and streamers because cake and celebrations seem to go together. I do all my designs for products sold on my online stores and this one is on t-shirts, posters, cups, aprons, cards, caps and other cute goodies at POP ART CAKE SLICE. Check it out and let me know if it makes you gain weight! In the sixties psychedelic light shows were everywhere. No party, gathering or concert was complete without one. In those days we had to rely on stage magic, black lights, disco balls with colored lights aimed at them and lava lamps for our visual experience. Not anymore. Thanks to modern technology and one man's truly innovative and creative mind, anyone can have their own personal high definition light show at the click of a mouse or flick of a finger. My friend, Brad, has created these wonderful animations called VizLoops - Active Art that will "turn your music on." The cool thing is they work with any and all of your music. Don't ask me how it works, Brad explained it to me and the explanation went so far over my head it needed an astronaut not a pilot! All I know is it does work and it will blow your mind - VizLoops are like a computer animated kaleidoscope on acid or valium depending on what music you're playing! You can play these animations along with your own music and they sync together. Try it yourself - turn the sound off on any of these test drives and turn on some of your own music and watch for a few seconds. You'll start to see the animation picking up the rhythm and beat of the sound. Brad calls it "PsychoSync" - your mind will synchronize the visuals with the sounds, it's absolutely amazing. I remember watching several of these on his humongous flat screen monitor last year and I would sit there glued to the screen. Can you imagine how cool a party would be with these playing on your hi-def TVs? You could also have them playing on every computer monitor in the house at the same time. Imagine all the lights dimmed and these playing with your party music. It would be an amazing experience. If you think you've seen some cool computer light shows, think again. These are light years beyond anything else out there. Brad's VizLoops are complex, fluid and visually stunning. Here's The Story of the VizLoop Birth. Lubralicious - this one is almost a meditation session! for the other VizLoop Light Shows and to purchase one for yourself - they are only $2.99 for a widescreen HD experience!